Added grouping for shape building. Previously, combining your own shapes with the set operators (such as Union) led to very unintuitive behaviour. Now, with proper shape grouping, combining shapes behave as expected. See BeginGroup for an example. Added symmetric difference for shape building. This new operator combines shapes by taking all points that are in either shape, but not in both. Added more parallelograms for triangular grids. Previously only one parallelogram was provided. Now there are parallelograms in all three orientations. Changed the diamond grid / point coordinate system to be more intuitive. For some reason, we had the X and Y axes swapped around. 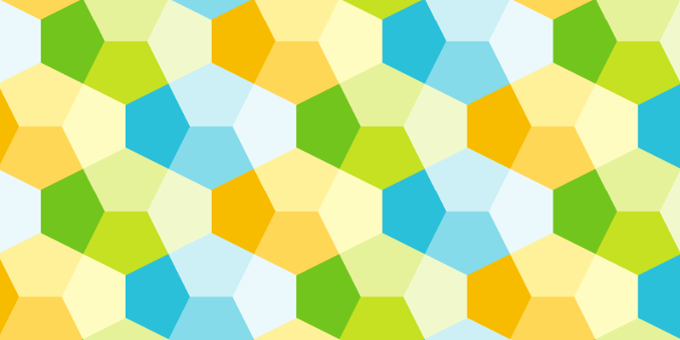 Fixed a bug with hexagonal shapes for triangular grids. This was caused by the unintuitive behaviour of combining shapes discussed above. Fixed a bug with composite shape building. Another bug caused by unintuitive shape combination. Fixed a bug with vertex and edge grids. Previously, vertex and edge grids would not work correctly for shapes that have been combined using the various set operators. This is now fixed. We also added an example that shows advanced shape building. Added PolygonMap for handling general polygon-grids. This makes it very easy to make new maps for grids made from polygons. It is the base for the new CairoMap. Added CairoMap, CairoGrid and CairoPoint as an example of an “exotic” grid. This new grid is for the Cairo pentagon tiling. Play a Lights Out game on a Cairo grid. We also added two more examples: one shows how to set up the Cairo grid; the other is the Lights Out game on a Cairo grid.